Given the tremendous boom in the information technology sector over the last few years and India’s present status as a software superpower, a job as a technology professional is among the most preferred career options for the youth of today. It’s no secret that technology plays a huge role in the running of almost every business today. According to Nasscom estimates, the USD 153 bn Indian IT-BPM industry is well on its way to touch the USD 350bn mark by 2025. Exports from India’s IT-BPM sector are also slated to grow at approx. 7-8% (excluding fluctuations in exchange rates). The domestic market is expected to follow suit, growing at an impressive 10-11%, adding approximately 130,000-150,000 employment opportunities this year alone. For students who want to take the first few steps towards a career in this exciting domain, there is no dearth of short-term computer related courses or diploma computer courses which can help you get started in right earnest. Most short-term courses have a duration of between 3-6 months or less (in some cases), depending on the course material. On the successful completion of which, every student is awarded a diploma or certification, as the case may be. 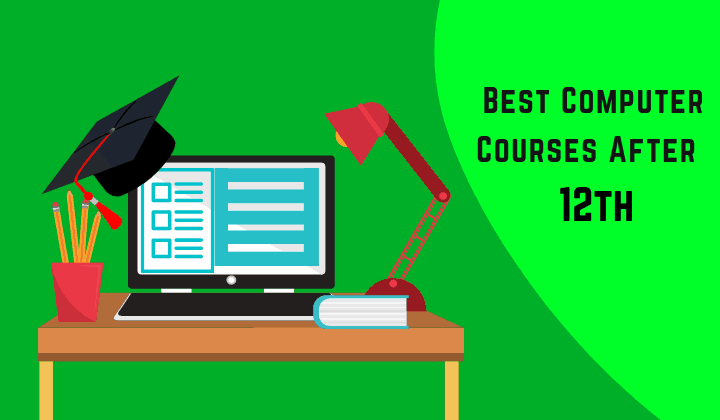 So here’s a checklist of best computer courses after 12th that you can consider pursuing to prepare yourself for a rewarding career. One of the most basic computer courses after 12th available, it’s designed to hone a student’s computer typing and data entry skills – which is the process of entering data into a computerised database or a spreadsheet. This IT course is well suited for those who do not seek or need very advanced knowledge about computers; it can help you get entry-level typing/data entry jobs in most companies. Microsoft Office, better known as MS Office is undoubtedly one of the most used software on computers, courtesy of its wide range of user-friendly applications that include the renowned MS Word, Excel and PowerPoint. A 3-6 month long MS Office computer course after 12th trains students in using the more advanced features and aspects of these popular applications, making them eligible for the steady stream of data-related jobs from a gamut of industries ranging from hospitality and retail to FMCG and E-Commerce. A part of graphic designing, Animation courses are fast becoming a famous computer course after 12th among students looking for a field of specialisation. As per a report by Research & Markets, the Indian animation industry is expected to grow by an impressive 15-20% to touch the USD 23bn mark by 2021. Most cities in India offer diploma courses in the field of Animation & VFX with a duration of six months to 2 years. This particular computer-related course after 12th generally offers students a choice between two options – as a short-term course after computer science between 3-6 months or a Computer Diploma course which may take up to a year. An integral part of Computer Science, it’s all about teaching you how to design and maintain websites. Given the growing popularity of the Internet of Things (IoT), even small companies today flaunt their own websites. Hence job options are plentiful upon the successful completion of this web designing course. One of the newer and more unique computer courses after 12th available, Digital Marketing covers a vast area related to the field of digital technology. Some of the key aspects covered by this course include: Search Engine Optimisation (SEO), Search Engine Marketing (SEM), Social Media Marketing (SMM), Content Writing, Affiliate Marketing, Email Marketing, Lead Generation, Brand Management, Web Analytics and Mobile Marketing. Joining a Graphic Designing course after 12th can provide you with a great platform to showcase your creative abilities. With the onset of the computer, this stream of design is being used everywhere and has multiple applications in varied fields. This professional computer course is better suited for students with a technical background. In fact, it’s ideally suited for engineering students from streams like electrical, mechanical or civil engineering. However 12th pass students with a technical bent of mind will also find this course useful in terms of gaining new skill sets. Certificate courses in computer-aided design and drafting (CADD) teach drafting techniques used mainly in the engineering and architecture domains. They also include training related to the use of CAD programs and planning & design software like AutoCAD, Fusion 360 and InfraWorks. Mobile phones today are an indispensable part of our lives. From indulging in online shopping to ordering food and playing virtual games, there is an app for almost everything these days. It’s a trend that has made mobile application development one of the fastest growing IT career paths today. A mobile application developer is typically responsible for designing and building impactful mobile apps for organisations looking to better their customer engagement practices. A computer can function optimally only as long as its software is updated and hardware is in perfect working condition. But just as software needs to be updated continuously, computer hardware is also prone to developing faults and minor/major niggles. As the name suggests, these job oriented computer courses are related to maintaining/repairing the computer hardware (external computer components viz. monitor, CPU, mouse, printer etc.). Students who enrol in this course are trained in the repair and maintenance of computer hardware. Regardless of whether you choose a short-term computer course after your 12th or computer diploma course, do ensure that you do it from a recognised and approved institute. Taking advantage of the growing demand, there are thousands of such institutes doing business in the country presently, but not all of them are genuine or recognised. So please do exercise extreme caution. Also do make sufficient inquiries about related issues like – the institute’s recognition status, fee structure, subjects covered, quality of the faculty and labs. Confirm your admission only after you have ensured the institute is above board on all of the parameters mentioned above. Last but not the least, do remember to check and verify its placement record if getting a job post the completion of the course is your immediate priority.